This page contains links to powerpoint or pdf files of some of the talks I have given on the physics of baseball. Anyone is free to download these files. If you use them in a talk, paper, or web site of your own, please link back or otherwise reference this site. Bats: They're Not Just Flying Mammals. The Science of the Baseball-Bat Collision. Slides of my talk at the 4th annual Saberseminar on Sabermetrics, Scouting, and the Science of Baseball, Boston University, August, 2014. In the presentation, I talked about general features of the baseball-bat collision, including how the batted ball speed depends on pitch and swing speed. 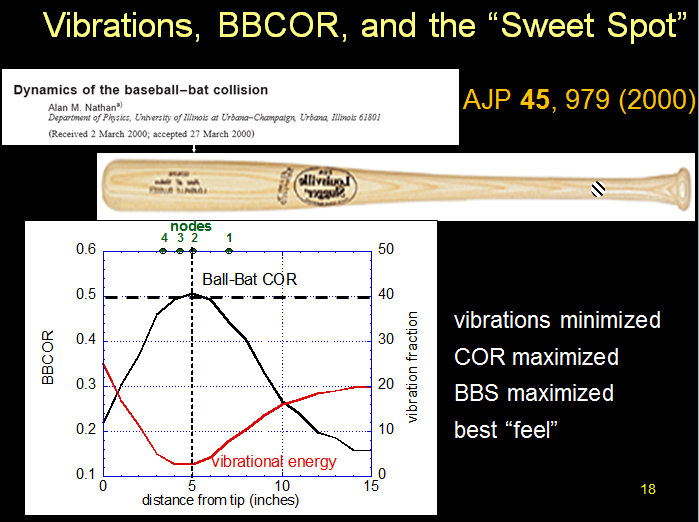 Also discussed are the role that vibrations play in determining the "sweet spot" of the bat, as shown in the slide above; the factors that contribute to bat performance; the reason why aluminum generally outperforms wood; and the use of science to regulate the performance of bats, especially as applied to the so-called BBCOR bats used by the NCAA and high schools. Slides of a talk I gave at the 3rd annual Saberseminar on Sabermetrics, Scouting, and the Science of Baseball at Boston University, August 2013. The talk focuses on "outcome-independent" metrics for batting, such as batted ball speed and vertical launch angle. 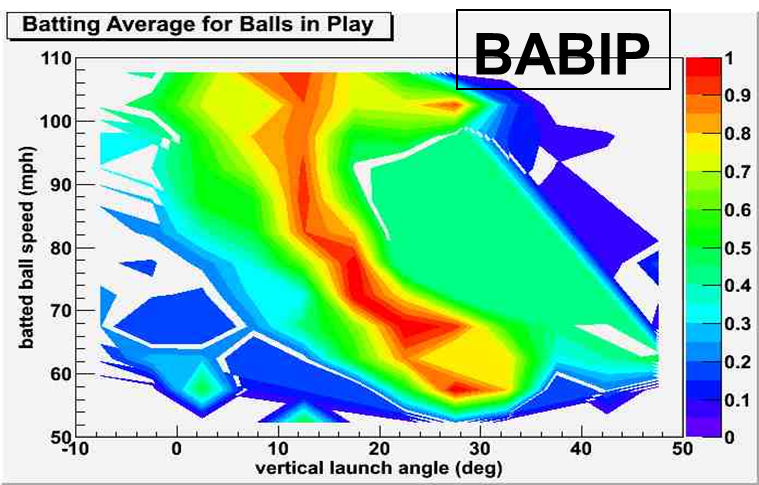 As an example, the slide above shows that if a ball is hit hard (> 90 mph) and at a launch angle in the range 10-12 degrees, it will result in a hit almost 100% of the time. The data are from the April 2009 release of HITf/x. Link to a YouTube video of a public lecture I gave in August, 2013 for the Chicago Council on Science and Technology (C2ST). The talk took place at U. S. Cellular Field. It was one of the most enjoyable lectures I have given recently, lots of fun for both me and the audience. The overall focus was how high-speed video clips from actual MLB games can reveal some of the very interesting physics involved in the game of baseball. Talk given at the 2nd annual Saberseminar on Sabermetrics, Scouting, and the Science of Baseball, Boston University, August 4-5, 2012. The talk presents an analysis of pitch-tracking data from MLB games involving either knuckleballers Tim Wakefield or R. A. Dickey. These data show that while "normal" pitches show predictable movement (left plot), knuckleball movement is random and unpredictable (right plot). Much more on this topic can be found here, including the accompanying paper. Talk given at the 9th Engineering of Sport Conference, July 9-13, 2012, in Lowell MA. The talk presents the results of experiments I performed to measure the spin of a batted ball and what it depends on. The plot shows the amazing result that the spin of the batted ball is essentially independent of the spin of the pitched ball for a incident angle of the ball with respect to the normal to the surface of the bat. A paper was published in the proceedings.